We are far enough and deep enough into the most heroic monetary and fiscal efforts ever undertaken to finally ask, why aren’t these measures working? So we are treated to an endless parade of news items that seek to convince us that a bottom is in and that we’ve ‘turned the corner’ – often on the flimsy basis that in the past things have always gotten better by now. The framework we operate from around here is simply encapsulated in the observation that there has never been global economic recovery with oil prices above $100 a barrel. That is shorthand for the idea that oil is the primary lubricant of economic growth and that it is not just the amount of oil one has to burn but also the quality, or net energy, of the oil that matters. If we want to understand why all of the tried-and-true monetary and fiscal efforts have failed, we have to appreciate the headwinds that are offered by both a condition of too-much-debt and expensive energy. Neither alone can account for the economic malaise that stalks the world. Trillions have been printed and injected into the world’s economies, and yet things seem to be barely limping along, requiring constant attention and interventions from both fiscal and monetary authorities. 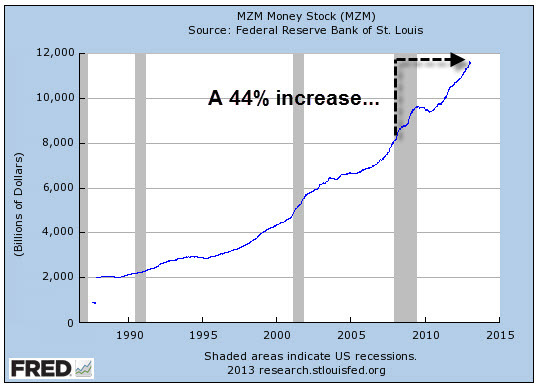 We could similarly look at the Federal Reserve balance sheet, or excess reserves, or a dozen other indicators that all say the same thing: The money supply has been expanded enormously. Since 2005 real – that is, inflation-adjusted – GDP has only expanded by 0.9% on an annualized basis. On a nominal basis (not inflation-adjusted), the number is only 2.9%, far below the 5%-6% required to sustain a banking system dependent on exponential growth in that range. 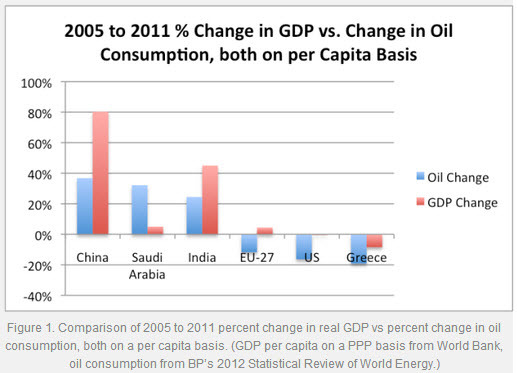 Oil and GDP are highly correlated and always have been. The general observation is that growth in GDP is usually higher than growth in oil consumption – as growth in oil consumption powers economic growth. Without growth in oil consumption, GDP growth doesn’t advance. 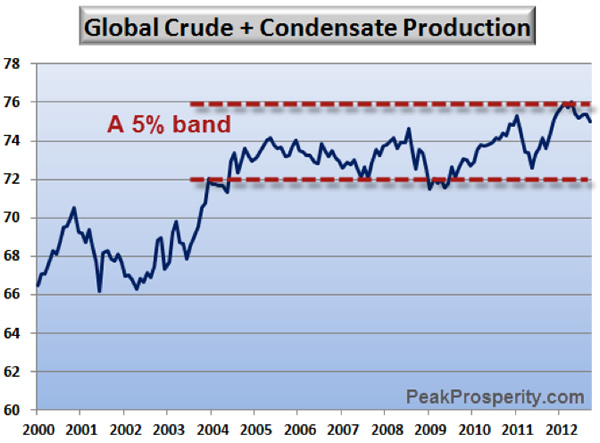 Back in 2009, in a piece entitled Oil – The Coming Supply Crunch (Part I), I calculated that every 1% increase in global GDP was associated with a 0.25% increase in oil consumption – in other words, a roughly 4:1 ratio. Since 2007, something quite remarkable has happened in the world of oil, and that has been a decline in the consumption of oil in the U.S. and Europe — with China and India pretty much making up the difference for everything that the West didn’t consume. If the view that oil consumption and economic growth are linked is correct, then we might easily imagine that simply making money cheaper and more widely available would do little to boost the real economy. Sure all that funny money will boost asset prices, but in this story, the tail does not and cannot wag the dog. Stock prices may rise, but unemployment will not budge. Bonds will become more expensive, but GDP will stall. Now the Fed is finally showing signs of saying hey, what gives? as its policies do little to improve the things it publicly admits to wanting to improve. In the three years after the Great Recession ended, growth in real gross domestic product (GDP) averaged only 2.2 per cent per year. In the same span of time following the previous 10 U.S. recessions, real GDP grew, on average, more than twice as fast–at a 4.6 per cent annual rate. So, why has the economy’s recovery from the Great Recession been so weak? [T]he unprecedented level and persistence of long-term unemployment in this recovery have prompted some to ask whether a significant share of unemployment since the recession is due to structural problems in labour markets and not simply a cyclical shortfall in aggregate demand. This question is important for anyone committed to the goal of maximum employment, because it implicitly asks whether the best we can hope for, even in a healthy economy, is an unemployment rate significantly higher than what has been achieved in the past. For the Federal Reserve, the answer to this question has important implications for monetary policy. If the current, elevated rate of unemployment is largely cyclical, then the straightforward solution is to take action to raise aggregate demand. If unemployment is instead substantially structural, some worry that attempts to raise aggregate demand will have little effect on unemployment and serve only to stoke inflation. As I said, the Fed is nibbling, but it is not yet even close to the centre of the conundrum. Yes, there are structural issues at play, but they have as much to do with expensive oil as they do with any great shifts in labour market trends. The main part to consider here is contained in the last two bolded parts in the above quote. If the Fed is just chucking more and more money into an economy that has fundamentally shifted into a lower gear, then all they are doing is laying the tinder for future inflation. Given the amounts involved, the potential for a very punishing period of inflation is quite high, for reasons often discussed here, such as in the recent article QE For Dummies. This leads us back to Gail Tverberg’s piece on economic sinkholes. Her main point in that piece was that in times past, higher investment led to higher output. That is, spending led to economic growth, especially investment spending. Carefully buried within higher oil prices are higher prices for every single economic activity that uses them. Along with diminishing ore yields come incrementally higher costs to simply, extract, and refine those ores, let alone fashion them into something useful. All types of mineral extraction, but particularly oil, eventually reach the situation where it takes an increasing amount of investment (money, energy products, and often water) to extract a given amount of resource. This situation arises because companies extract the cheapest to extract resources first, and move on to the more expensive to extract resources later. As consumers, we recognise the situation through rising commodity prices. There is generally a real issue behind the rising prices — not enough resource available in readily accessible locations — so we need to dig deeper, or apply more “high tech” solutions. These high tech solutions indirectly require more investment and more energy, as well. While we don’t stop to think about what is happening, the reality is that increasingly less oil (or other product such as natural gas, coal, gold, or copper) is being produced, for the same investment dollar. As long as the price of the product keeps rising sufficiently to cover the higher cost of extraction, the investor is happy, even if the cost of the resource is becoming unbearably high for consumers. The summary here is that it takes more and more to achieve less and less. The old form of economic growth is no longer with us, but the Fed still doesn’t get it. It still has its eyes firmly trained on economic indicators and equations, having not yet raised its gaze into the real world where limits are being reached. As Gail nicely encapsulates, many of those limits are carefully hidden from view as a slightly but steadily reducing net energy for oil seeps into every nook and cranny of our complex economy. HARRISBURG, Pa.—With midnight approaching on New Year’s Eve, Sherri Lewis and her two children knelt to pray for a better year ahead. A few minutes later, she heard a rumbling that sounded like fireworks. The ground outside her apartment had opened up, revealing a municipal disaster that shows how far this city’s finances have sunk. A sinkhole, measuring about 50 feet long and eight feet deep, had swallowed Ms. Lewis’s street, damaging water and gas pipes and forcing more than a dozen residents to evacuate one of the city’s poorest neighborhoods. “I thought the world was ending,” says Ms. Lewis, 42 years old. 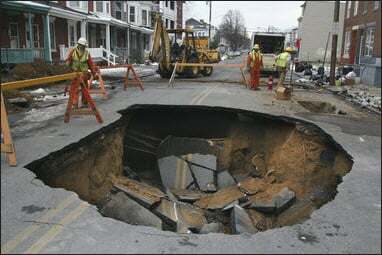 Harrisburg officials have identified at least 40 other sinkholes around the 50,000-person city. The combination of particularly sandy soil and leaky pipes under Harrisburg’s streets make it susceptible to sinkholes, city officials say. But Harrisburg has a bigger problem: The Pennsylvania capital can’t afford to replace many of the ageing pipes, some of which date back to the 19th century. The metaphor perfectly offered by Harrisburg is that once you run out economy, your current infrastructure alone may be well beyond your means to maintain. The embodied energy in just our existing property, plant, and equipment is enormous. Nearly every high-tech dream – of a kinder, gentler future where 9 billion people somehow enjoy higher average standards of living than the current 7 billion – requires an extraordinary investment of energy. Left out of this dream is a crisp articulation of exactly where that energy will come from and when we will begin to transition to prioritizing its use towards building and maintaining all of that new infrastructure. It’s not enough to merely buy electric cars, should they ever be manufactured in sufficient quantities, because we also need new grid components, electrical storage, generation, and a thousand other components to pull it off. I note that with every passing year, more and more internal combustion engine (ICE) vehicles are manufactured and sold, not fewer and fewer. The past 7 years has seen the number of new ICE vehicles sold grow at a compounded rate of 3.7% per annum, and at that rate, 2013 should see more than 80,000,000 sold. That’s up from just over 50,000,000 only 10 years ago. Every one of those represents the investment of energy and capital that will consume our remaining oil at the expense of anything else we might choose to do with that oil, such as maintain our current infrastructure as we build out the next one. As we dump more and more money into the economy, hoping with all our collective might that it will once again sputter back to life and lift all fortunes and boats, too few are asking what happens if it does not. If there are other factors at work here besides a simple case of too much debt, then the Fed is not only barking up the wrong tree, but is unaware that a very dangerous animal with a bad attitude is resting up there. These are truly extraordinary times. I am in awe of the number of otherwise professional investors who believe that the Fed has things safely in hand. The amount of market insanity and complete disconnect from reality has me thankful that I already lived through a similar time and can keep things in perspective now. That time was 2005 to 2007, when I was trading quite actively and thought the world had gone mad. Nothing made sense, because I was trying make sense of things that could not be made sense of. In times of extraordinarily abundant liquidity and loose monetary policies, all that has to be understood is that financial assets tend to run up in price during such moments. The fact that this all ended quite badly then does little to make me think this time is going to end any better. Thin-air money, attempting to print one’s way to prosperity, and spending more than you have are proven losers in the history books. Yet here we are, doubling down – we’re all in and I guess there’s no turning back now. The Fed is going to keep with the program until forced to change by circumstances. As I see it, the economy is broken and it will stay that way. Our only hope for an alternative would be to immediately cut our losses in those enterprises that do not make sense in a world of increasingly expensive liquid fuels, and invest heavily in those things that will help us transition to a future without fossil fuels. I am quite aware that many decades’ worth of fossil fuels remain, but equally aware that all energy transitions require four to six decades under ideal conditions where one is transitioning to a higher quality fuel source and capital is expanding. And under less-than-ideal conditions, where we are transitioning to a lower density energy source (as all alternative energy sources are) and capital is shrinking? There we might imagine it could take longer than usual; a 100-year transition period is not out of the question. In the meantime, the best I can tell you is that the markets are reflecting liquidity, not reality, and that until and unless the world suddenly starts to produce a lot more crude oil and the U.S. and Europe increase their consumption of it, I will remain quite sceptical of all pronouncements of recovery in the West.